Eduard Brossolette, a representative from the Bank of France, stops by the London office of Gaylord and Carnot Engravers to pick up the plates for new 5,000 franc notes. Sir John Rutheford, representing the engraving company, tells him that a messenger with proper papers had already picked them up that morning. Brossolette states that these missing plates will soon be used by the thieves to produce a flood of counterfeit money. 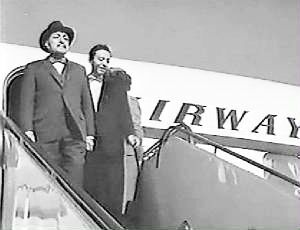 Arriving in London from New York at the request of Inspector Duff, Charlie Chan and son Barry meet with Sir John. Chan agrees to work alone on the case to find the identity of those who stole the plates. Amid extreme secrecy, so as not to set off a panic, Chan and Barry fly to Paris. Upon their arrival, Inspector Chauvet of the Paris Police informs Chan about Spanish Roy, Roy Bernard, a notorious forger who had produced the false documents that were used by those who stole the engraved plates in London. When asked how Chan had come across the forged documents, Chan, honoring his promice of secrecy, refuses to answer. Chauvet warns Chan not to interfere in the business of the French government. As Chan and Barry leave, Chauvet gives orders to have them tailed. Back at his hotel room, Chan, while checking in with Inspector Duff, finds that his phone has been tapped. That evening, Barry, working alone, stops by a cafe that turns out to be run by Spanish Roy. Having picked Barry's pocket and realizing his true identity, Spanish Roy sends him on his way, suggesting that he stick to tourist spots. Back at their hotel, Barry is surprised by the arrival of Spanish Roy who is suddenly shot by an unseen assailant through the window. Saved by a pocket chess game, Spanish Roy, after a brief discussion, leaves and is immediately arrested by Inspector Chauvet who hands Chan deportation papers, instructing him to leave the country within 24 hours. The next morning, Brossolette informs Chan that the deportation has been lifted and that the French Government has issued him a letter of general authority to proceed with his investigation. Chan tells Barry, "Phone call to Minister of Finance most effective." Visiting Spanish Roy, whom he has had freed, Chan discusses the French Underground for which Spanish Roy had worked during the war. Chan finds that a part of the Underground, has been reactivated for criminal purposes. Spanish Roy states that he made the false documents for this group at the request of the French Secret Service. Chan finds that the section Maquis commander from whom Spanish Roy received orders was a man code-named Michel, whose true identity he could not reveal. The next morning, Spanish Roy hurriedly writes out Michel’s true identity and contact information, giving it to Barry who is entrusted to give it to his father. Sir John, arriving at the hotel room, convinces Barry to give him the note, and sends him to Inspector Chauvet with another note. At Chauvet’s office, after reading Sir John's note, arrests Barry. Meanwhile, Chan has uncovered the location of Michel. Arriving, Chan finds that he is none other than Sir John. Sir John tells Chan that he cannot escape as the building is surrounded by Maquis Circuit members. At police headquarters, Spanish Roy informs Inspector Chauvet that they have been duped by Sir John who is in reality a traitor. Soon, Spanish Roy arrives where Sir John holds Chan. Freeing Chan, Sir John flees, only to be gunned down by Circuit members waiting for him outside of the building. Charlie Chan (to Spanish Roy): "I have feeling orange circuit of the Maqui is still active." Maqui: The Maquis, meaning "underbrush," were rural guerrilla bands of French Resistance fighters, called maquisards, during the German occupation of France in World War II. Colonel at War Ministry (to Charlie Chan): "25, Rue Bayard." 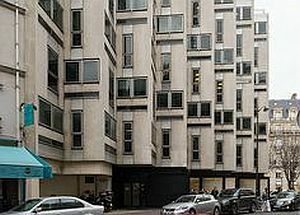 25 Rue Bayard as it appears today. Charlie Chan (to Sir John Rutherford): "Why does a man in your position have to became a criminal?" Detectives, like busmen, must also have holiday. Silence often speaks louder than words. Eyesight of blind officials sometimes restored by appeal through pocketbook. Volcanoes sometimes errupt when least expected.